Hilton Sandestin Beach Golf Resort & Spa boasts 40,000 sq. ft. of flexible indoor ballroom space in addition to 20,000 sq. ft. of expansive outdoor deck space. Our variety of space including the beach, decks and ballrooms can accommodate any size guest list, making the resort a sought-after choice among Destin wedding locations. With stunning Gulf views as the backdrop, transforming our beach into your dream ceremony venue comes naturally. Or perhaps you prefer the beach simply as a complement to the ballroom space. At Hilton Sandestin Beach our Wedding Manager will help you in customizing your special day with our wide selection of ceremony and reception choices. In addition to hosting your special day we also offer our expansive deck space for welcome receptions, rehearsal dinners and farewell brunches. Our 20,000 sq. ft deck breaks down into three main deck spaces, the Sunrise Deck, Barefoot’s Deck and the Sunset Deck. Regardless of which deck you choose the views are unparalleled – and the beach is never far and all decks may be configured for ceremonies and other wedding celebration events. The Sunrise Deck is 4,000 square feet and accommodates 240 with banquet set up, and up to 325 reception style. Barefoot’s Deck is 8,000 square feet and accommodates up to 800 guests. The Sunset Deck is 5,500 square feet and accommodates up to 500 guests reception style. Our indoor ballrooms make elegant venues for your wedding reception. The Emerald Ballroom is 9,504 square feet and accommodates up to 1,200 guests, with beach inspired chandeliers to set events aglow. 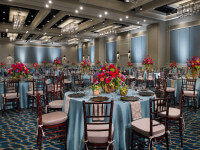 With 16-foot ceilings suitable for more elaborate events and decorations, the Coastal Ballroom is 7,500 square feet and includes a separate foyer perfect for guests to enjoy the cocktail hour. The Coral Ballroom is 5,600 square feet and its layout can be configured for guest lists from 25 to 700 giving couples the ability to choose over the top or understated for their event. Our special event rooms, including the 1,730 sq. ft. Sandpiper room, sit secluded within the resort for intimate celebrations. Our hospitality suites are very popular for brides seeking a private retreat to get ready before the ceremony. Used as a “Ready Room,” bride and her bridesmaids can gather, enjoy a snack, and share the thrill of the final preparations in the hours leading up to the ceremony. These suites can also accommodate exclusive gatherings before or after the wedding ceremony –featuring a wet bar, casual seating and a private bathroom. For the ultimate in exclusivity, we’ll leave you with a final suggestion: A rehearsal dinner, private or small-group dining experience at Seagar’s Prime Steaks & Seafood. 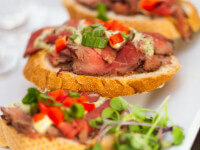 The resort’s signature restaurant – and the only Destin-area restaurant to receive a AAA Four-Diamond rating – makes a stunning impression with its menu (featuring USDA prime beef, fresh local seafood and more), a 600+ label wine list (Wine Spectator commends it) and a tableau of cool colors against rich woods. Contact your Hilton Sandestin Beach Wedding Manager today — we’re looking forward to hearing from you!